I haven’t made a loaf of simple white bread in several years, (even though I bake bread every week) and this loaf from "Cuisinart’s The Connoisseur's Choice May 1991" looked like a good one to try. It’s quick and so simple, the dough was very easy to handle, and it took just 6 common ingredients! And let’s talk about quick…less than 2 hours, most of it waiting. If you don’t have a bread pan, shape a round or braided loaf and bake it on a pizza pan or cookie sheet. Use bread or all-purpose flour, whatever you have. I set my processor bowl with the blade in it right on my scale and weigh in the flour, and after the dough is kneaded, I let it rise right in the workbowl – why wash another bowl? This loaf can be mixed in even the smallest standard size or Classic processor…because it uses 3 cups or less flour the steel blade is the best choice. 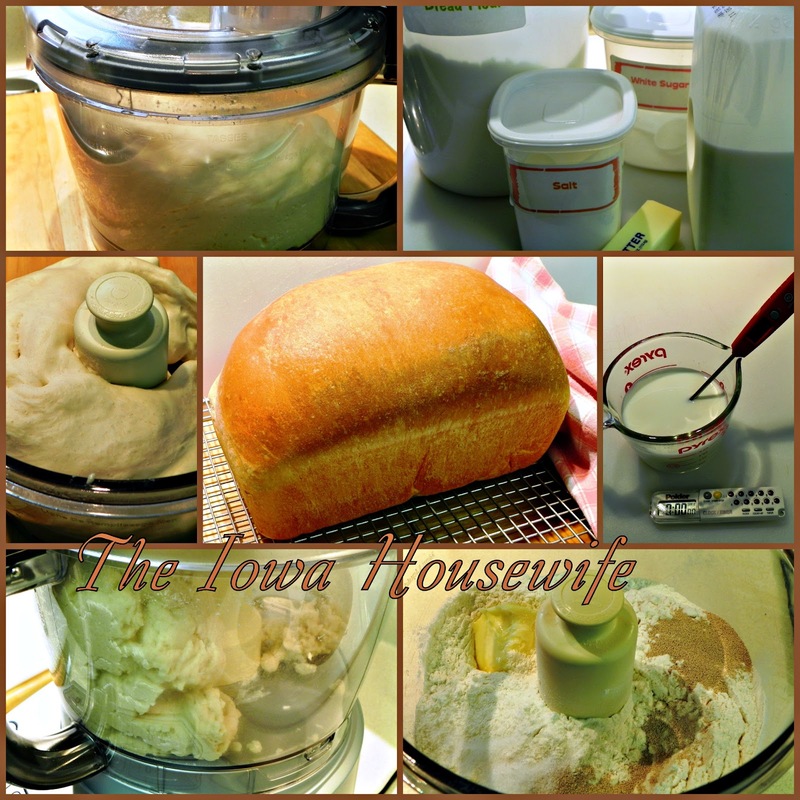 If you want more information on making bread in your food processor, check HERE. Combine all dry ingredients and butter into processor bowl. Use steel blade. Mix about 5 seconds, until combined. Heat liquids to 120-130°. With motor running, pour liquid through the feed tube in a steady stream as fast as the flour absorbs it. Continue processing until dough cleans the side of the work bowl, about 45 seconds, then let the machine run to complete kneading, about 60 seconds. Dough will be fully kneaded. Let rise in covered work bowl, about 10 minutes. Punch dough down. Shape into a loaf and place in a greased 8 1/2 x 4 1/2 x 2" loaf pan. Let dough rise in pan, covered with oiled or sprayed plastic wrap or waxed paper until center is 1" above rim of pan. Preheat oven to 375° while the dough is rising in the pan. Bake in the center of the preheated oven until loaf is well-browned and sounds hollow when tapped on the bottom, about 35 minutes. Test with an instant-read thermometer in the end of the loaf - it should read 195° to 200° if done. Brush the top of the slightly cooled loaf with butter for a soft crust if desired. Per Serving with milk: 114 Calories; 2g Fat (18.0% calories from fat); 3g Protein; 20g Carbohydrate; trace Dietary Fiber; 5mg Cholesterol; 154mg Sodium. Exchanges: 1 1/2 Grain(Starch); 0 Non-Fat Milk; 1/2 Fat; 0 Other Carbohydrates. **The recipe directions are for “Instant” or Rapid-rise or Bread Machine yeast only. Like you, it seems, I make 'just white' bread only once in a great while, but,....it's going to happen today! This picture of the bread you made is screaming (in a good way) 'MAKE ME,...TODAY!' I have a 14-cup Cuisinart processor, so................ I'm off. I never would have guessed to use the steel blade, but it's what I'm going to do....thanks much! I made this bread yesterday-- it was quick, easy, beautiful and so good! The baked loaf did not even 'survive' long enough to have its picture taken. Thanks! I made bread the other week and it "fell". I wasnt too happy, but I may give this one a try! Don't let the center of the loaf rise more than an inch over the side of the pan before putting it in your hot oven. The bread will "spring" in the oven and give you a nice loaf that won't fall. Bake it long enough - an instant-read thermometer inserted in the end of the loaf should read at least 190° for regular bread. excellent. replaced butter with oil(grapeseed) replaced milk with water. added a bit more yeast(my yeast is old). came out perfect! Can i use regualr yeast instead of instant? Yes, absolutely. If you do, you will need to let your first rise be about 1 hour, and your second rise will probably take 45 minutes to 1 hour, depending on your room temperature. Don't let the center of the loaf rise more than an inch above the side of the pan - that's my criteria for how long the 2nd rise should be. Bake it in the same time as the recipe calls for. Hi Sue! I just made a loaf of bread using my old Cuisinart and have it baking outside in my Sun Oven! I can hardly wait to try it! I usually make my bread in a bread machine, but thought I'd try a different method this time. Thanks for sharing! Blessings from Bama! Interested in your baking in a Sun Oven...hope you like your bread. I used to have a bread machine, but as I only used it for dough, and either the mixer or food processor are so much faster, I couldn't justify the space in my kitchen for a one-trick pony. Yes, I double it and double the ingredients, but I usually make it in my Kitchenaid mixer then. If your processor is large enough it probably would work...or make it twice - it only takes minutes. In this recipe it's considered part of the dry ingredients because the processor cuts it up if it's cold. You can also heat it with the liquids if you are used to that method.